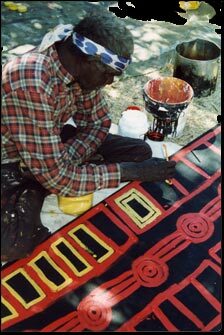 Profile: Timothy Payungka was one of the original painters at Papunya in 1971, having come out of the desert west of Kintore with his wife and child in 1962. He returned to Kintore when it was established as a settlement in 1981, then went further west to Kiwirrkura when a settlement was established there, close to his birthplace. He was a senior figure for the important claypan site of Parrayingi, where large numbers of people gathered after rains in pre-settlement days. This painting reproduces a traditional ceremonial shield design representing those ancient claypan ceremonies.